Women and men have always explored the natural world, but biographies have often stressed the life-risking adventures of men crossing oceans or scaling mountains or surviving extreme climates. 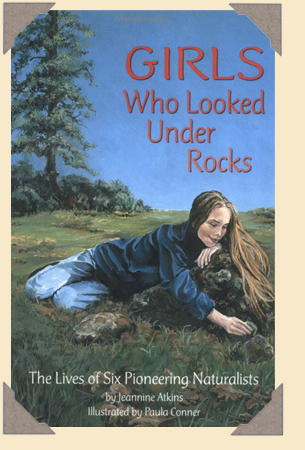 I wrote Girls Who Looked Under Rocks to bring more attention to women who pushed past discouragement and used their curiosity and passionate intelligence to break into work studying and caring for fields, forests, and the creatures who make these their homes. I hope the naturalists who put animals -- from bumble bees to chimpanzees -- at the center of their lives will inspire girls to follow their lead as scientists, explorers, and conservationists. Maria Sibylla Merian (1647-1717) was an artist and scientist who’s known to us today mostly because of the beautiful paintings she left of plants and insects. In 1699, she sailed from Europe to South America to paint insects in their environment. Anna Botsford Comstock (1854-1930) helped found the movement to teach nature in schools. She was the first woman professor at Cornell University, where she taught entomology. Fran Hamerstrom (1907-1998) left a modeling career to spend many hours of many days over many years watching prairie chickens. Her close observations not only saved the lives of birds in the mid-west, but helped us understand how destruction of habitat endangers animals. Rachel Carson (1907-1964) loved language as well as science; she claimed she couldn’t write truthfully about the sea without writing poetry. Silent Spring, in which she spoke for the birds endangered by human carelessness, helped begin today’s environmental movement. Jane Goodall (1934-) used the patience she practiced as a girl watching animals on a farm in England when she traveled to Africa to study chimpanzees. She continues to devote her life to the well-being of these forest animals, as she travels around the world lecturing about how to make the world safe for everyone. Miriam Rothschild (1908- 2005) became renowned as a scientist for investigating the lives of fleas. She discovered over 3,000 species! After World War II, she became alarmed by the way plowing down old meadows destroyed wildflowers and insects that depended on each other. Miriam Rothschild promotes planting “butterfly gardens” and other means to preserve wild flowers and the insects who depend upon them. There are few renderings of some of the naturalists who lived over a century ago, but Paula Conner took a very close at these sources to make charcoal drawings of the women at work. Paula skillfully studied the women’s features and transposed them using models; members of her family helped by posing so she could study the way an elbow bent or the shapes of fingers on a microscope. To learn more about the book, or for suggestions about ways to use books to enrich nature study, visit Dawn Publications. To purchase, please visit your favorite local shop or click on one of these links: Indiebound.com or Amazon.com.